Random House Books for Young Readers, 9781524767617, 368pp. Is middle school drama scarier than an asteroid heading for Earth? Find out in this smart and funny novel by the author of The Miscalculations of Lightning Girl. Every day in middle school can feel like the end of the world. Eleanor Dross knows a thing or two about the end of the world, thanks to a survivalist grandfather who stockpiles freeze-dried food and supplies--just in case. So when she reads about a Harvard scientist's prediction that an asteroid will strike Earth in April, Eleanor knows her family will be prepared. Her classmates? They're on their own! Eleanor has just one friend she wants to keep safe: Mack. They've been best friends since kindergarten, even though he's more of a smiley emoji and she's more of an eye-roll emoji. They'll survive the end of the world together . . . if Mack doesn't go away to a special school for the blind. 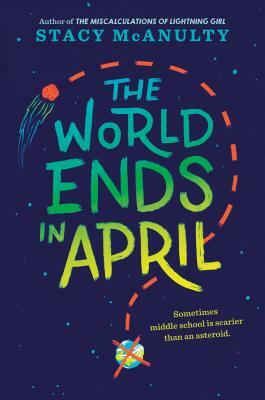 But it's hard to keep quiet about a life-destroying asteroid--especially at a crowded lunch table--and soon Eleanor is the president of the (secret) End of the World Club. It turns out that prepping for TEOTWAWKI (the End of the World as We Know It) is actually kind of fun. But you can't really prepare for everything life drops on you. And one way or another, Eleanor's world is about to change.